Allegiance to ancestor worship by province of China, according to a survey held in 2007. An ancestral worship ceremony led by Taoist priests at the pyramidal-shaped Great Temple of Zhang Hui (张挥公大殿 Zhāng Huī gōng dàdiàn), the main ancestral shrine dedicated to the progenitor of the Zhang lineage, located at Zhangs' ancestral home in Qinghe, Hebei. A stone tortoise with the "Stele of Divine Merits and Saintly Virtues" (Shengong Shende), erected by the Yongle Emperor in 1413 in honor of his father, the Hongwu Emperor in the Ming Xiaoling Mausoleum ("Ming Mausoleum of Filial Piety"). Chinese ancestor worship, or Chinese ancestor veneration, also called the Chinese patriarchal religion, is an aspect of the Chinese traditional religion which revolves around the ritual celebration of the deified ancestors and tutelary deities of people with the same surname organised into lineage societies in ancestral shrines. Ancestors, their ghosts, or spirits, and gods are considered part of "this world," that is, they are neither supernatural (in the sense of being outside nature) nor transcendent in the sense of being beyond nature. The ancestors are humans who have become godly beings, beings who keep their individual identities. For this reason, Chinese religion is founded on veneration of ancestors. Ancestors are believed to be a means of connection to the supreme power of Tian (Shangdi), as they are considered embodiments or reproducers of the creative order of Heaven. Confucian philosophy calls for paying respect to one's ancestors, an aspect of filial piety; Zhuo Xinping (2011) views traditional patriarchal religion as the religious organisation complementing the ideology of Confucianism. As the "bedrock faith of the Chinese", traditional patriarchal religion influences the religious psychology of all Chinese and has influenced the other religions of China, as it is evident in the worship of founders of temples and schools of thought in Taoism and Chinese Buddhism. Ancestor veneration practices prevail in south China, where lineage bonds are stronger and the patrilineal hierarchy is not based upon seniority, and access to corporate resources held by a lineage is based upon the equality of all the lines of descent; whereas in north China worship of communal deities is prevalent. Some contemporary scholars in China have adopted the names "Chinese traditional patriarchal religion" (中國傳統宗法性宗教 Zhōngguó chuántǒng zōngfǎ xìng zōngjiào) or "Chinese traditional primordial religion" (中国传统原生性宗教 Zhōngguó chuántǒng yuánshēng xìng zōngjiào) to define the traditional religious system organised around the worship of ancestor-gods. Zhang Jin and Yang Chunpeng, based at the Folk Religion Institute and Party School Theory Research Section of Xuanen County, in an article on the China Ethnic and Religious Network define Chinese traditional primordial religion as faith in God (Shangdi)'s original form. According to Zhuo Xinping (2011), Chinese patriarchal religion and Confucianism complemented each other in ancient China, as the Confucian religion traditionally lacked a social religious organisation while traditional patriarchal religion lacked an ideological doctrine. In Chinese folk religion, a person is thought to have multiple souls, categorized as hun and po, commonly associated with yang and yin, respectively. Upon death, hun and po separate. Generally, the former ascends into heaven and latter descends into the earth and/or resides within a spirit tablet; however, beliefs concerning the number and nature of souls vary. In accordance with these traditional beliefs, various practices have arisen to address the perceived needs of the deceased. The mourning of a loved one usually involves elaborate rituals, which vary according to region and sect. The intensity of the mourning is thought to reflect the quality of relationship one had with the deceased. From the time of Confucius until the 20th century, a three-year mourning period was often prescribed, mirroring the first three years in a child's life when they are utterly dependent upon and loved unconditionally by their parents. These mourning practices would often include wearing sackcloth or simple garb, leaving hair unkempt, eating a restricted diet of congee two times a day, living in a mourning shack placed beside the house, and moaning in pain at certain intervals of the day. It is said that after the death of Confucius his followers engaged in this three-year mourning period to symbolize their commitment to his teachings. Funerals are considered to be a part of the normal process of family life, serving as a cornerstone in inter-generational traditions. The primary goals, regardless of religious beliefs, are to demonstrate obeisance and provide comfort for the deceased. Other goals include: to protect the descents of the deceased from malevolent spirits and to ensure the proper separation and direction of the deceased's soul into the afterlife. Some common elements of Chinese funerals include the expression of grief through prolonged, often exaggerated wailing; the wearing of white mortuary clothes by the family of the deceased; a ritual washing of the corpse, followed by its attiring in grave clothes; the transfer of symbolic goods such as money and food from the living to the dead; the preparation and installation of a spirit tablet or the use of a personator, often symbolic. Sometimes, ritual specialists such as Taoist priests or Buddhist monks would be hired to perform specific rites, often accompanied by the playing of music or chanting of scripture to drive away evil spirits. Burial is often delayed according to wealth; the coffin would remain in the main room of the family home until it has been properly prepared for burial. More traditionally, this delay is pre-determined according to social status: the corpse of a king or emperor would be held in abeyance for seven months; magnates, five; other officers, three; commoners, one. In some instances, a "lucky burial" can take place several years after the burial. The bones are dug up, washed, dried, and stored in an earthenware jar. After a period of storage, the contents are then interred in their final resting place in a location selected by an augur to optimize the flow of qi. A bad qi flow could result in a disgruntled spirit who could possibly haunt their descendants. The deceased would often be buried with sacrifices, typically things one was thought to be in need of in the afterlife. This was done as a symbolic demonstration of filial piety or grandeur. For the wealthy and powerful, bronze vessels, oracle bones, and human or animal sacrifices often accompanied the deceased into the grave. More common sacrifices included candles and incense, as well as offerings of wine and food. After the funeral, families often install an ancestral tablet at a household altar alongside other deceased ancestors. This act symbolically unifies the ancestors and honors the family lineage. Incense is lit before the altar daily, significant announcements are made before them, and offerings such as favorite foods, beverages, and spirit money are given bi-monthly and on special occasions, such as Qingming Festival and Ghost Festival. Prayer was usually performed at the household altar in a separate room containing the po of their ancestors. The eldest male would speak to the altar on a regular basis. In some belief systems where special powers are ascribed to the deceased, he may supplicate the spirit to bless the family. ↑ Chinese Spiritual Life Survey (CSLS) 2007. Report by: Xiuhua Wang (2015, p. 15). ↑ Zhou (2003), p. 42. ↑ Nadeau (2010), p. 369. ↑ Yao & Zhao (2010), pp. 113-116. ↑ Yang & Tamney (2011), p. 281. ↑ Overmyer (2009). "As for the physical and social structure of villages on this vast flat expanse; they consist of close groups of houses built on a raised area, surrounded by their fields, with a multi-surnamed population of families who own and cultivate their own land, though usually not much more than twenty mou or about three acres. [...] Families of different surnames living in one small community meant that lineages were not strong enough to maintain lineage shrines and cross-village organizations, so, at best, they owned small burial plots and took part only in intra-village activities. The old imperial government encouraged villages to manage themselves and collect and hand over their own taxes. [...] leaders were responsible for settling disputes, dealing with local government, organizing crop protection and planning for collective ceremonies. All these factors tended to strengthen the local protective deities and their temples as focal points of village identity and activity. This social context defines North China local religion, and keeps us from wandering off into vague discussions of ‘popular’ and ‘elite’ and relationships with Daoism and Buddhism." 1 2 Zhang Jin, Yang Chunpeng. “中国传统原生性宗教”的产生和特点 ("Chinese traditional primordial religion": generation and characteristics). 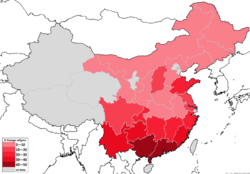 China Ethnic and Religious Network (中国民族宗教网), 2013. ↑ China Confucius Network: 人文主义宗教与宗教人文主义. 1 2 3 Yang & Tamney (2011), p. 280. ↑ Yang & Tamney (2011), pp. 280-281. 1 2 Thompson, L. G. (1979). Chinese Religion: An Introduction Third Edition. Belmont, California: Wadsworth, Inc. He, Qimin (2012). "Religious Traditions in Local Communities of China". Pastoral Psychology. 61 (5): 823–839. doi:10.1007/s11089-012-0438-z. ISSN 0031-2789. Nadeau, Randall (2010). "Divinity". In Nadeau, Randall L. The Wiley-Blackwell Companion to Chinese Religions. Overmyer, Daniel L. (2009). Local Religion in North China in the Twentieth Century: The Structure and Organization of Community Rituals and Beliefs (PDF). Leiden; Boston: Brill. ISBN 9789047429364. Wu, Hsin-Chao (2014). "Local Traditions, Community Building, and Cultural Adaptation in Reform Era Rural China" (PDF). Harvard University. Yao, Xinzhong; Zhao, Yanxia (2010). Chinese Religion : A Contextual Approach. London: New York: Continuum. ISBN 9781847064752. Zhou, Jinghao (2003). Remaking China's Public Philosophy for the Twenty-first Century. Greenwood Publishing Group. ISBN 0275978826. Zhuo Xinping, "Spiritual Accomplishment in Confucianism and Spiritual Transcendence in Christianity," in Yang, Fenggang; Tamney, Joseph, eds. (2011). Confucianism and Spiritual Traditions in Modern China and Beyond. BRILL. ISBN 9004212396.